I eat a big salad for lunch almost every day, year round. But when the weather turns blustery and wet, I don’t really want to tramp through the muddy garden to pick lettuce or arugula. And, just the thought of washing lettuce gives me chilblains. I want soup! 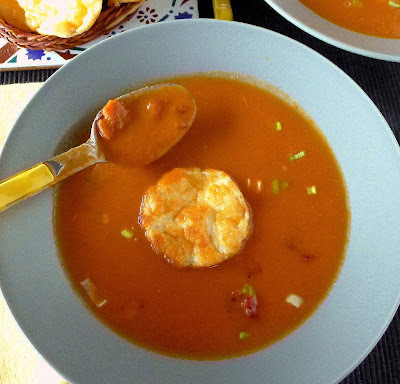 Robust tomato soup with bacon and cheese discs. Today, it’s a traditional Spanish tomato soup. No, tomatoes aren’t really in season. But I found good plum tomatoes from the Canary Islands, really cheap. Canned tomatoes are just as good for winter cooking. Sun-dried tomatoes, an ingredient I found in La Mancha, give extra depth of flavor. The old-fashioned version of this soup calls for tocino—fatty salt pork. The rendered fat plus olive oil give the soup a rich creaminess. Bacon can be substituted for the tocino. (Or, omit completely if you’re doing a vegetarian version.) Smoky pimentón de la Vera gives this simple tomato soup a heady aroma, with or without the bacon. Use any well-flavored stock—chicken, beef, or lamb—or, for a vegan version, mushroom. Usually this soup is slightly thickened with bread. Since I’m avoiding carbs, I eliminated the bread, but added about ½ cup of chopped zucchini to add a bit more body. For a silky texture, first purée the soup in a blender, then pass it through a conical chinois strainer. You will be surprised how many tomato pips get strained out. 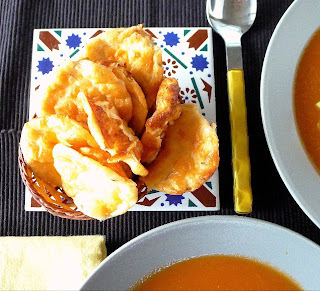 Serve the soup garnished with discs of cheese flan or with croutons of fried bread. If desired, add pasta, such as fideos, to the soup. Heat the oil in a soup pot and fry the bacon until lightly crisped. Skim out the bacon and reserve. Add the onion, garlic and celery to the fat and sauté on a medium heat until onion is golden, about 5 minutes. Stir in the bread crumbs, if using, and fry 1 minute longer. 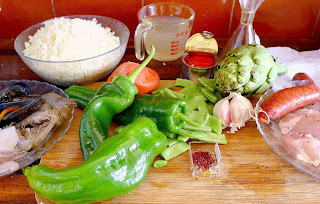 Remove pot from the heat and blend in the pimentón and cayenne. Add both kinds of tomatoes and return to a high heat. Cook 5 minutes until tomatoes begin to sweat out their liquid. Stir frequently. Add the broth, salt (quantity depends on saltiness of the broth), pepper, thyme, parsley and mint. Bring to a boil, reduce heat to a simmer, and cook, covered, 45 minutes. Cool slightly 20 minutes. 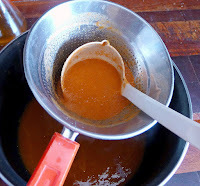 Purée the soup using an immersion blender or in batches in a regular blender. Pass the soup through a chinois strainer, pressing on the solids. Discard solids. Reheat soup before serving. 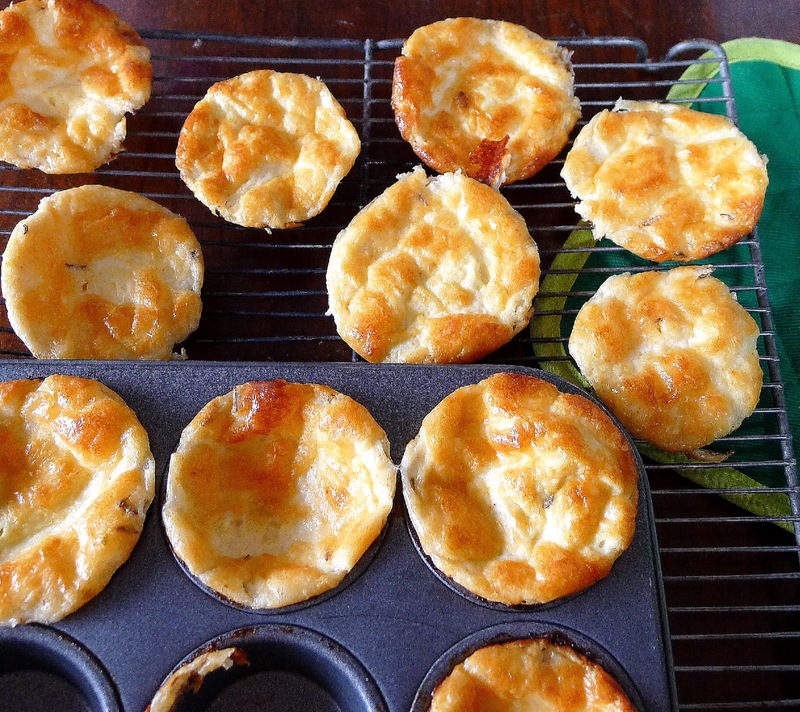 Serve garnished with reserved bacon bits, chopped fresh herbs, and, if desired, discs of cheese flan. Discs of cheese flan to serve with soup. 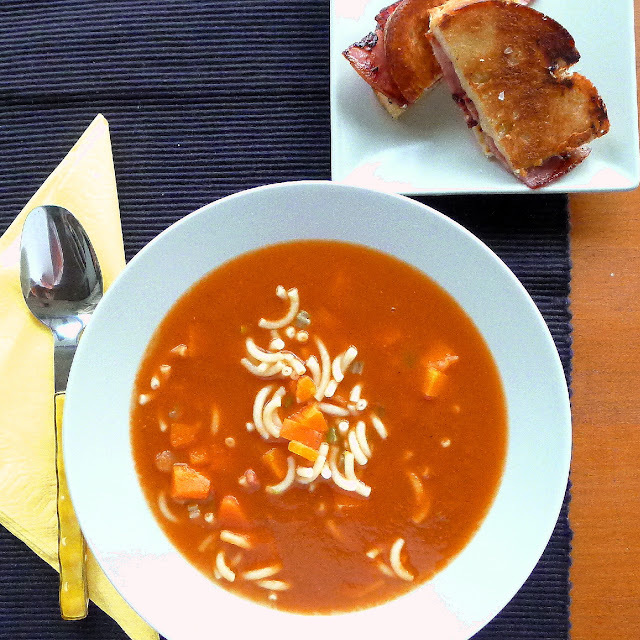 Kid-pleasing variation--add diced carrots and fideo noodles to the soup. Grilled cheese and bacon on the side. 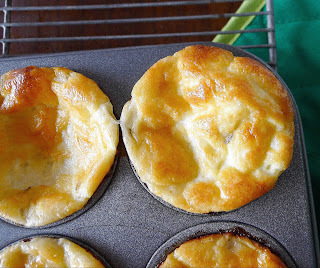 Flans baked in mini-muffin pan. 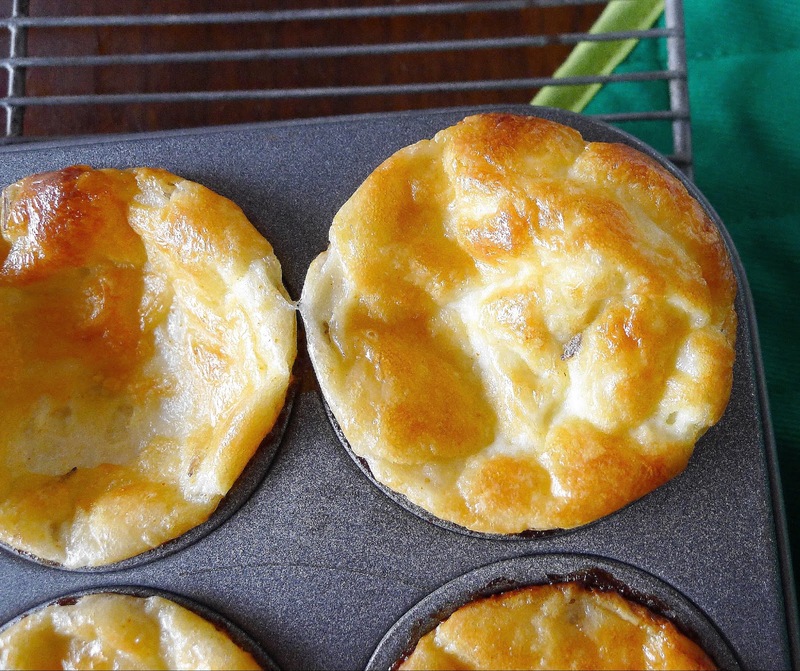 I baked this cheese “pudding” in mini-muffin pans, creating 2-inch discs. Otherwise, bake the flan in a cake or pie pan. The flan puffs up in the oven, but immediately deflates. I was surprised to find caraway seed, which I associate with German rye bread, widely used in La Mancha cooking. It definitely complements the cheese. 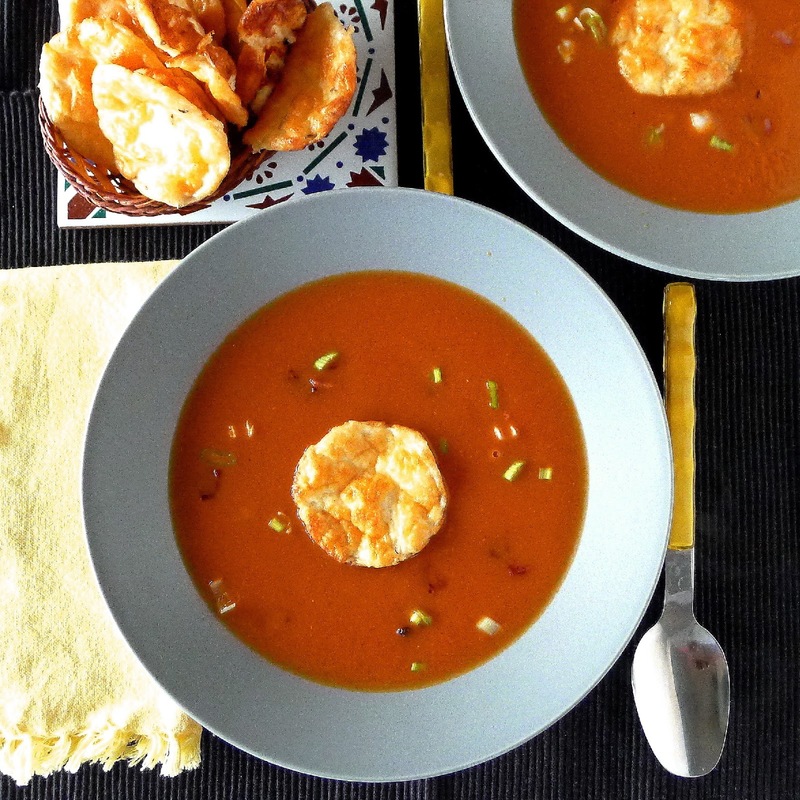 Add these cheesy discs to soup or serve as a snack with wine. Combine the eggs, milk, cayenne, thyme, caraway, salt, and cheese. Ladle into two mini-muffin pans that have been lightly oiled or one 8-inch cake pan. Bake until golden on top and a skewer comes out clean, about 30 minutes for the mini-muffins. Remove the flans from the pan while still warm and let them cool on a rack. Serve hot or room temperature to be added to the soup at the table. If it’s January, it must be diet season. 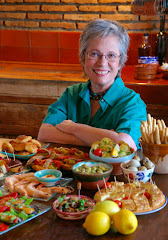 The diet is going just fine—I´m down a pound or two (not yet a kilo!). 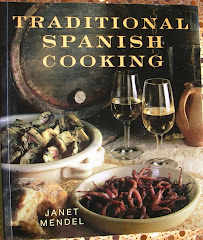 My problem is how to cook and write about Spanish food while dieting. 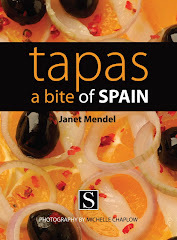 Is there anything in Spanish cuisine that doesn’t require bread, potatoes or rice? Even if those favored carbohydrates are not part of the recipe—think gambas al ajillo, ibérico ham, boquerones en vinagre—they are essential as an accompaniment. 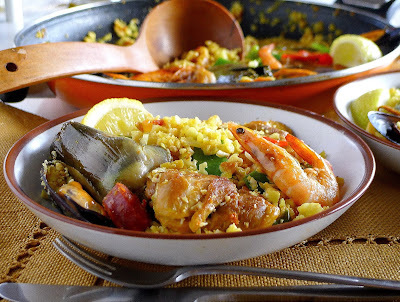 How can you just eat the shrimp and not sop up the sizzling garlicky olive oil in the cazuelita of gambas al ajillo? For a couple of weeks, I’m “doing Atkins,” so it’s low, low, low carbs. As a food-centric person, dieting is engaging—planning what to eat and how to cook it is as challenging as planning a dinner party! Kernels of chopped cauliflower stand in for rice in this paella with typical ingredients. So, I’ve managed to come up with a dish with real Spanish flavors—paella—but without the carb-heavy rice! 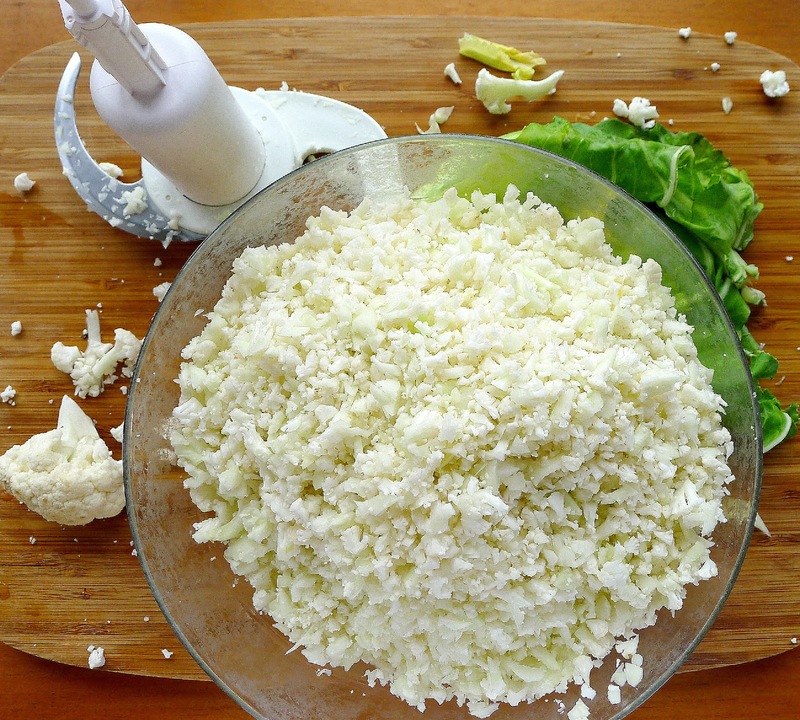 Cauliflower, chopped to rice-size kernels, takes the place of rice. 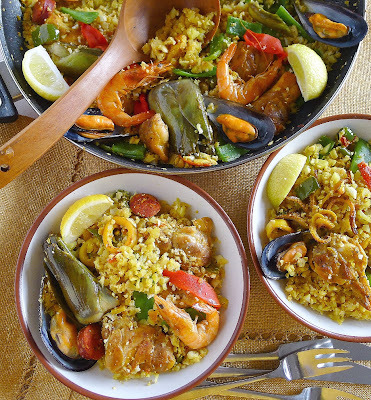 Most of the other ingredients are typical to Spanish paella. While it may not rate highly on anyone’s paella list, let me tell you, it’s probably the best cauliflower in the world! 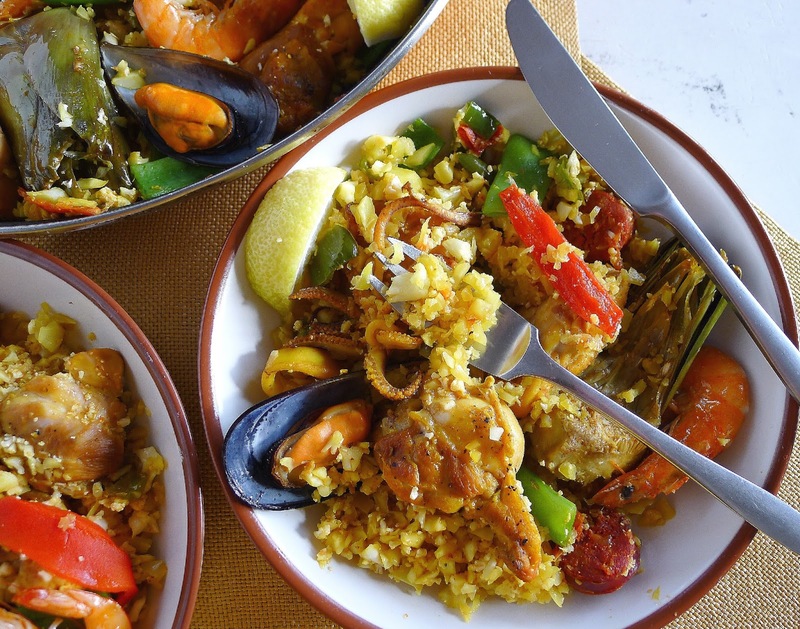 Chicken, shrimp, mussels, squid, chorizo, artichoke--and saffron-tinted cauliflower "rice." Cauliflower "grains" have a slight crunch. 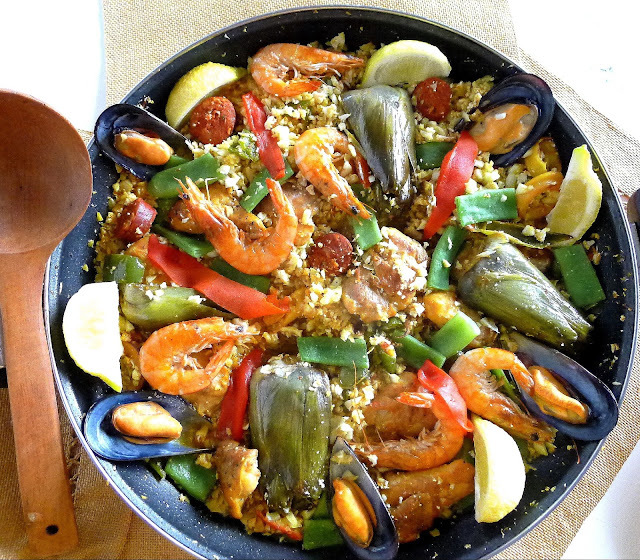 Ingredients similar to traditional paella. Cut out and discard the center stalk of the cauliflower. Cut into florets. Working in two batches, add the florets and small stems to food processor and pulse until they are chopped to the consistency of rice grains. Reserve. Cut the chicken thighs into three or four pieces. Season with salt and pepper. Cook the green beans in salted water until crisp-tender. Drain and reserve. Steam the mussels open. When cool enough to handle, discard empty shell. Reserve mussels on half-shell. Place the crushed saffron in a small bowl and add hot water. Add the chicken pieces to the pan on medium-high heat, turning them to brown both sides. Strip outer leaves from the artichoke. Cut it in quarters. Scoop out the fuzzy choke and place the artichokes, cut-side down, in the oil. (If added to the pan immediately, no need to soak them in lemon water.) Sauté the artichokes, turning them occasionally. Sofrito of chicken and vegetables. Add the cut-up squid, green pepper and garlic to the pan and sauté 5 minutes. Add the chopped tomatoes and sliced chorizo. 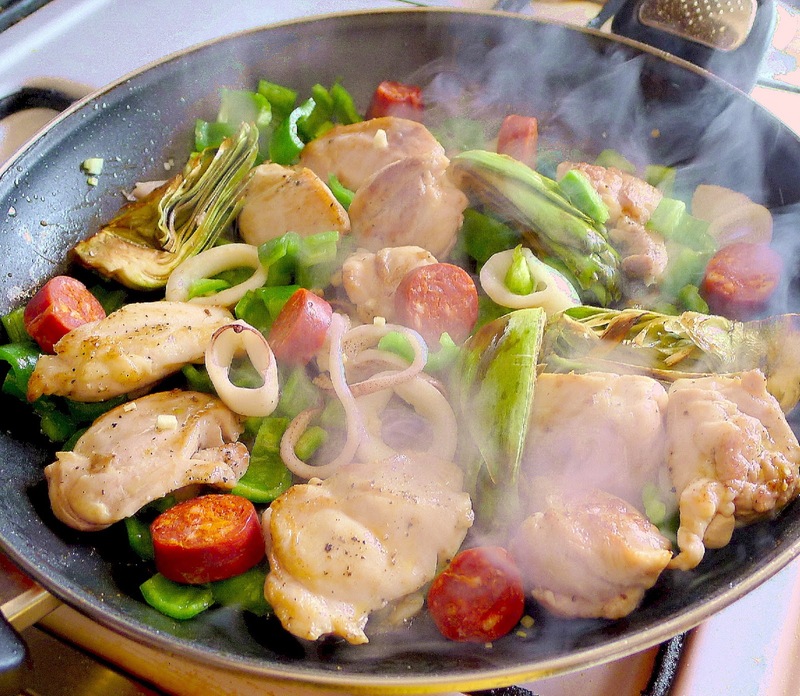 Cook chicken, artichokes, squid and vegetables 10-15 minutes, until chicken is cooked through. 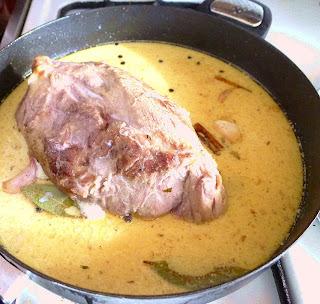 Add the saffron-water and stock. Taste the liquid in the pan and add more salt if necessary. Add the bay leaf or rosemary. 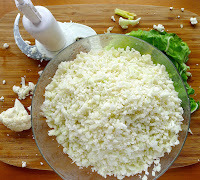 Bring to a boil and add the cauliflower “rice.” Stir to combine all the ingredients, arranging them in the pan. Add the reserved green beans. Place the cooked shrimp on top and the mussels around the edge of the paella. Cook on a medium heat (liquid just bubbling) until cauliflower is done to your liking—7 minutes for a slight crunch, up to 15 minutes for soft (you may need a little more stock). Move the pan around on the stove, so it cooks evenly, but don't stir. Discard bay leaf or rosemary. 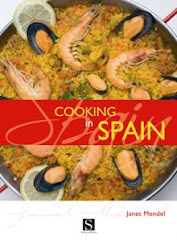 Garnish the top of the paella with strips of red pimiento. Let set 5 minutes. Serve with lemon wedges. Guests peel the shrimp at the table. To eat the artichokes, pick them up by the tip and bite the thick heart. Discard the leaves and tips. Mojama is air-dried tuna. 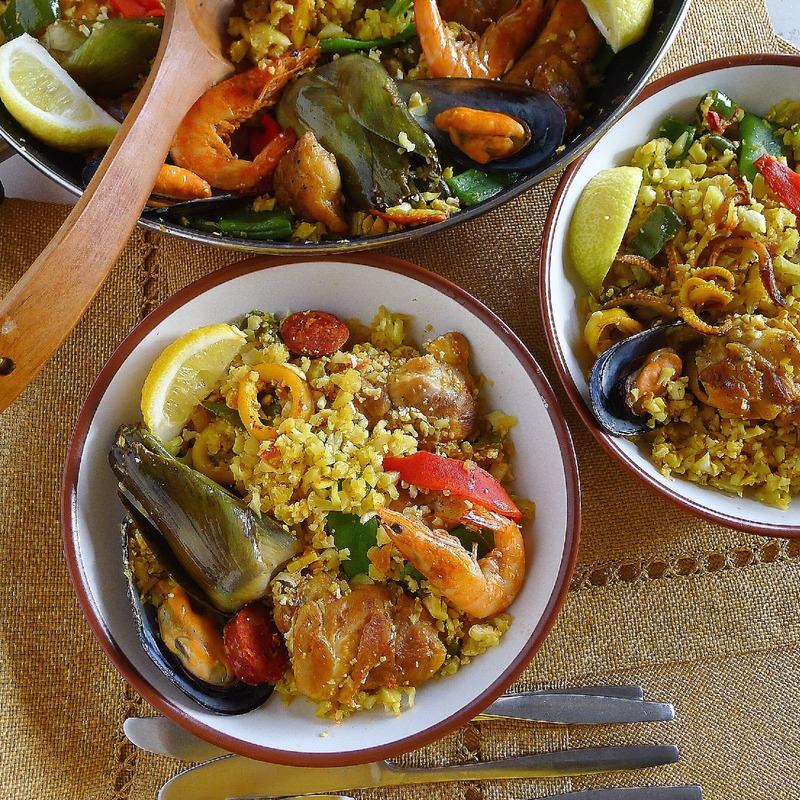 Serve it with extra virgin olive oil, coarsely ground black pepper and grated lemon zest. 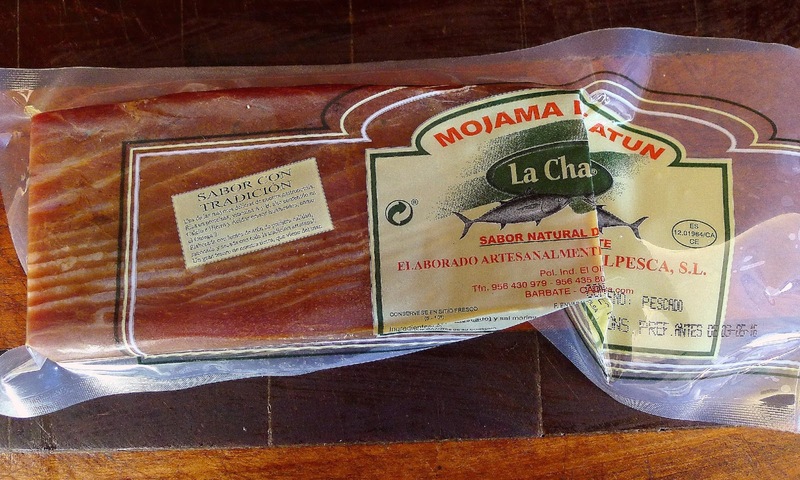 Mojama, sometimes called the “ham of the sea,” is an unusual product, not so widely known, although it has been produced on the Atlantic and Mediterranean coasts for millennia. The Phoenicians, who founded the city of Gadir—Cádiz—around the year 1100 BC, exploited the copper and silver mines of western Andalusia and took over trading routes from the Atlantic to the Mediterranean. 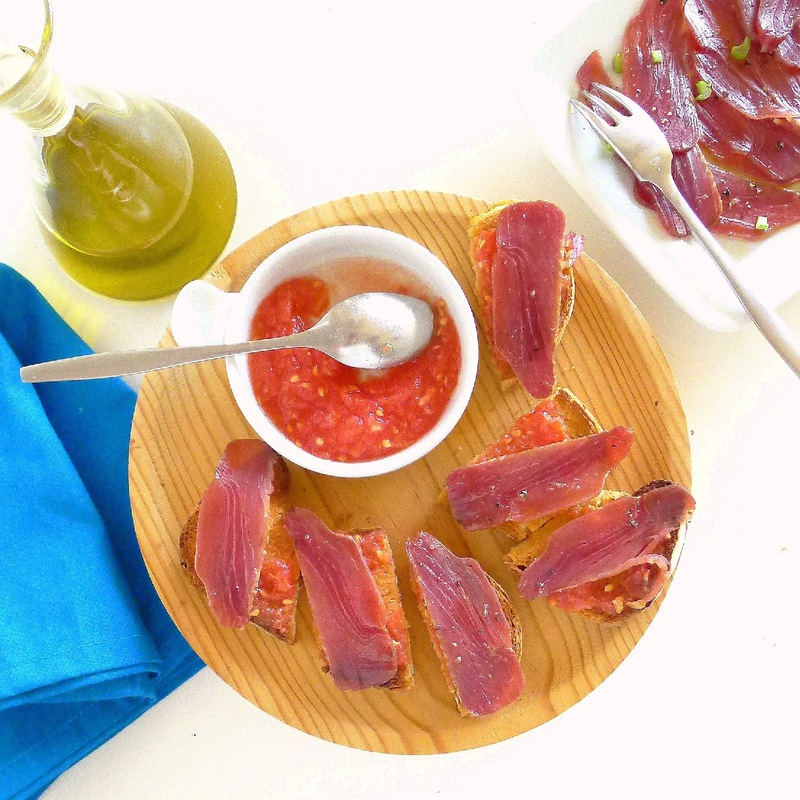 Salted fish, made from abundant tuna that migrated through the Straits of Gibraltar, was a product that could be kept on long sea voyages and traded at far-away markets. Mojama is made from thick slabs of tuna—bluefin, albacore, yellowfin—that are packed in sea salt for a day or two, then washed and hung to air-dry. 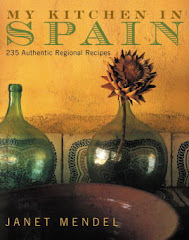 The process, indeed, is similar to that for producing serrano and ibérico hams. The salting draws the moisture out of the flesh. As it dries, the flesh becomes firm, compacted. The flavor intensifies. Lovely gift--12-ounce package of mojama from Barbate. 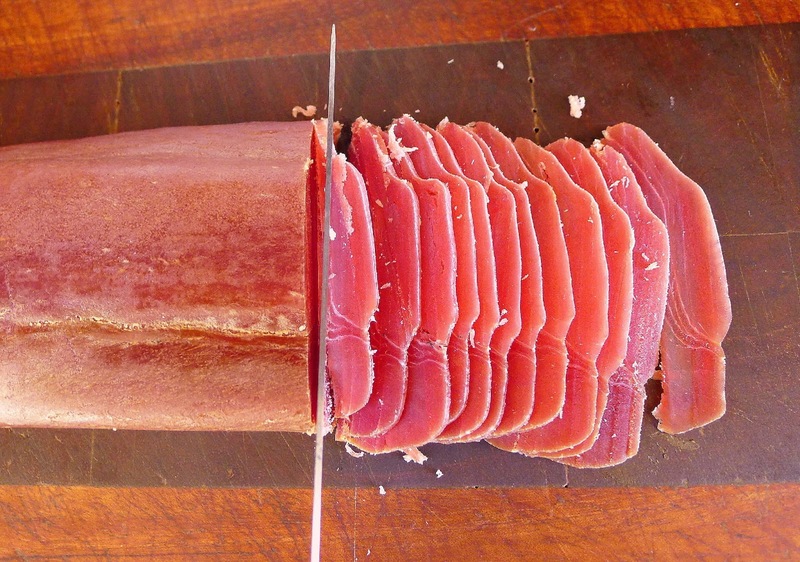 The best quality mojama is cut from the lomo, side of the tuna, closest to the center spine. It is veined with fat which keeps the flesh fairly soft and pliable. Outside cuts taken from near the skin don’t have this streaking and become stiffer in the drying process. I have had mojama that was like cardboard or tough jerky. The taste of mojama? Salty, like good ham, not like anchovies. It has marine overtones, a subtle iodine, but is not “fishy.” It’s a rich, umami taste. Because it’s a concentrated flavor, a little mojama goes a long way. 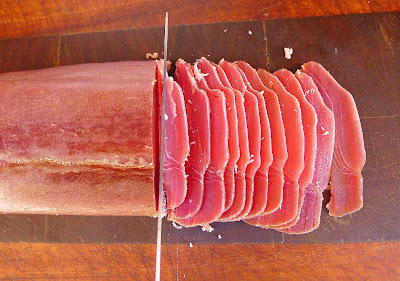 Slice mojama thinly--about the width of a knife blade (1/16th inch). Marinate in extra virgin olive oil for 30 minutes before serving. 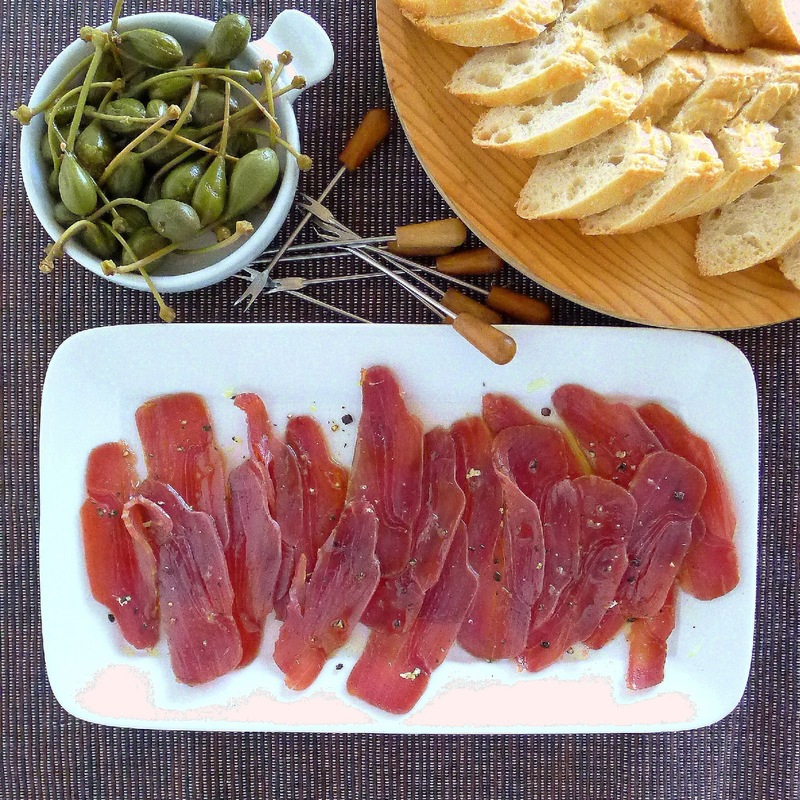 Good quality mojama is thinly sliced, moistened with extra virgin olive oil and served with bread. It can also be cut in dice or, if very firm, grated, and used as a flavor garnish. 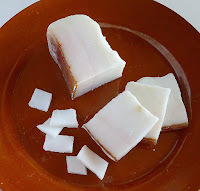 Unlike another dried fish, bacalao, salt cod, mojama is not soaked before using. It is never cooked. In addition to the simple, classic presentation, I’ve discovered that mojama can be used in dishes in place of anchovies or canned tuna. Here are some suggestions. 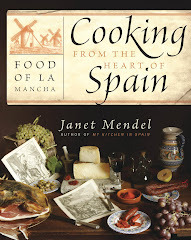 Fino Sherry or manzanilla is the best wine with mojama, in my opinion. Breakfast or apéritif? 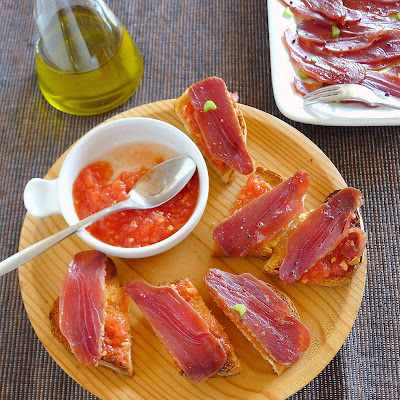 Here sliced mojama tops toasted bread spread with grated tomato and drizzled with extra virgin olive oil. 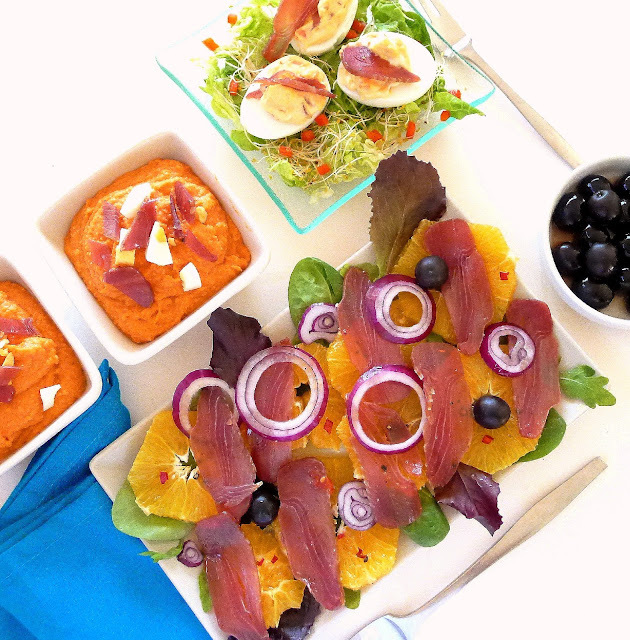 Mojama with Andalusian tapas--bottom, salad with oranges, onions and olives; left, salmorejo, a thick gazpacho cream; top, stuffed eggs. 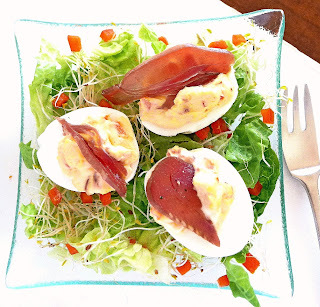 To make the stuffed eggs: Hard-cook eggs. Separate the yolks and mash them with a spoonful of Dijon mustard, lemon juice, chopped red pepper, chopped mojama and a little mayonnaise to make a smooth mixture. Fill the whites and top them with strips of mojama. This Málaga salad is usually made with salt cod. 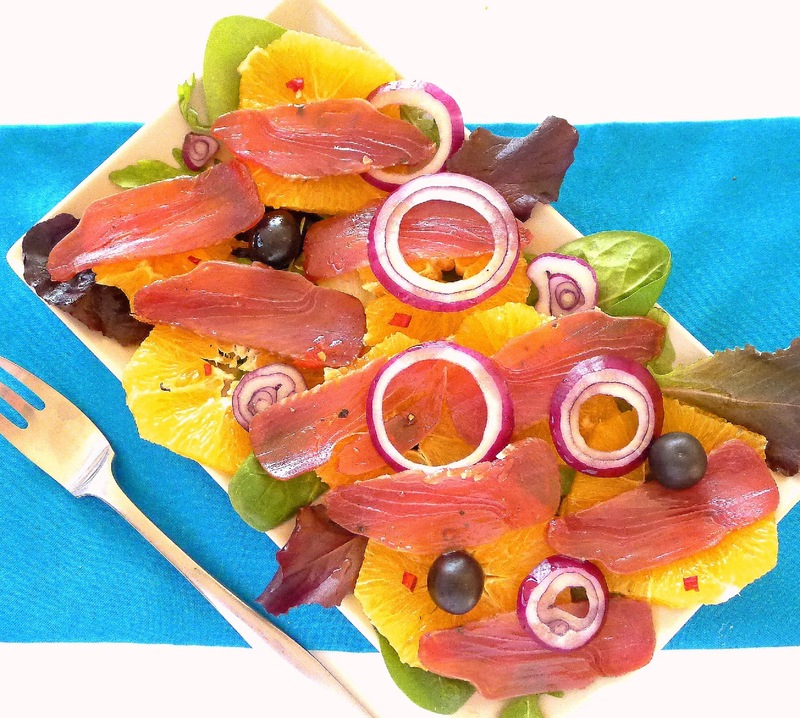 Layer sliced oranges, onions and sliced mojama on a serving plate. 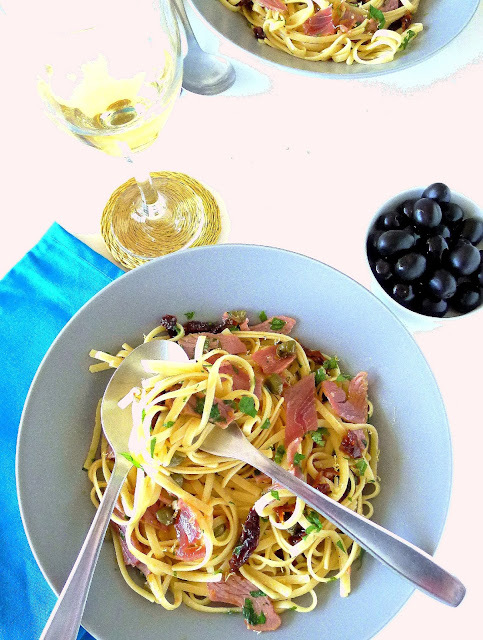 Dress with extra virgin olive oil, red pepper flakes and black olives. Pasta with mojama, garlic, chile and sun-dried tomatoes. 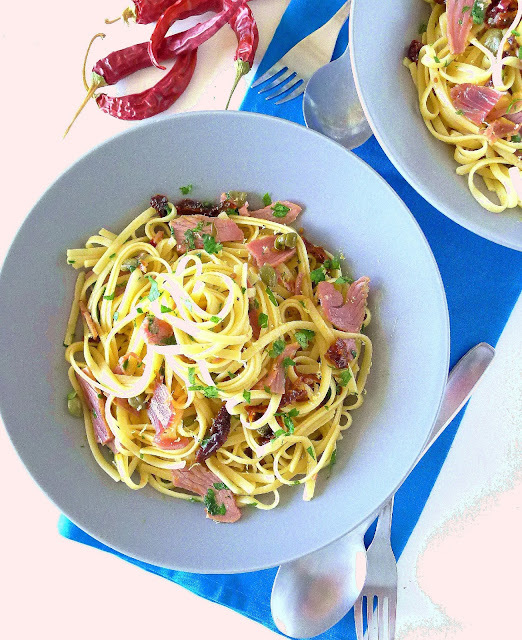 Mojama tuna replaces anchovies in this version of pasta alla puttanesca. Place slivered tomatoes in a small bowl and cover with hot water. Let stand 10 minutes. Drain. Heat oil in a skillet. Add sliced garlic to cold oil. When garlic begins to color, add pepper flakes and sun-dried tomatoes. Cook 4 minutes. Add the capers. Drain the pasta, reserving ¼ cup of the cooking liquid. Swirl the liquid into the skillet. Add the cut-up mojama and the parsley. Add the drained pasta to the skillet and toss with the oil. Season with salt and pepper. (Salt may not be needed.) Serve the pasta into heated bowls and grate a little lemon zest over each serving. Not that it’s been very cold here in southern Spain. The mimosa was blooming at Christmas, the almond trees for New Year. Nevertheless, slow-cooked, braised meat is such a comforting winter’s meal. 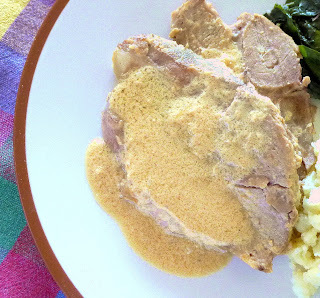 Looking for a way to cook a hunk of pork (boneless shoulder), I came across my recipe for lomo con leche—pork loin braised in milk, a recipe from Galicia (northwest Spain). 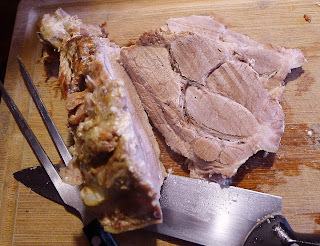 I haven’t made this in years, because I recall how dry the loin was after braising. Honestly, I don’t know why pork loin is so appreciated. Yes, it’s a compact shape with no connective gristly bits. It’s terrific sliced and flash-fried with garlic. I don’t even care for bone-in loin chops—except for those marbled-with-fat ibérico ones. Loin just doesn’t have enough fat to keep it juicy. Pork shoulder braised in milk, with sides of mashed potatoes and rainbow chard. 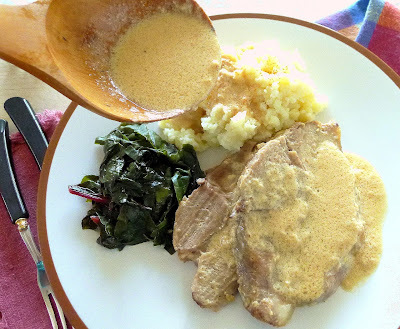 However, I sort of remembered the delicious gravy from that pork braised in milk. So, I used my piece of pork shoulder in the recipe. Yes! The meat was tender and juicy in about 1 ½ hours. The gravy is not thickened with flour. After the meat is removed, the sauce is reduced. The milk thickens into tiny curds. Lots of gravy to ladle on the potatoes. With such good gravy, mashed potatoes make a good side. (I mashed the potatoes with olive oil, then ladled some of the cooking liquid into the potatoes to smooth them.) 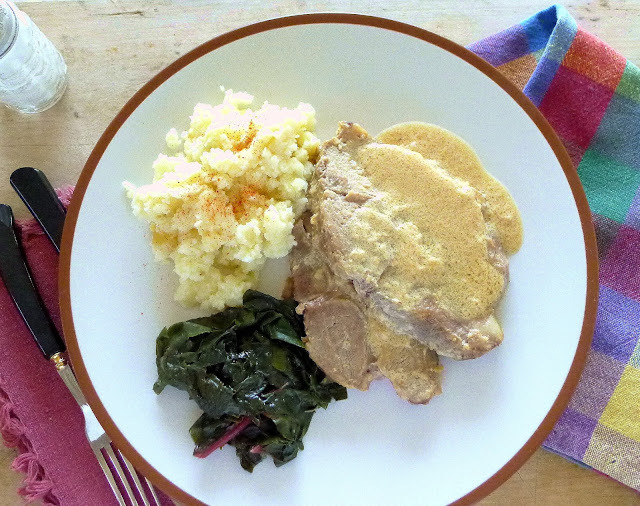 Galician greens, such as grelos, broccoli rabe, go with the pork. I cooked rainbow chard from the garden. I think next time I make this, I’ll braise a bunch of tiny onions with the pork. Or, leave the peppercorns in the sauce. Sprinkle pork with salt and pepper and allow it to come to room temperature. Heat oil or lard in a pan and slowly brown the meat on all sides. Brown meat, then add milk. Add the milk, unpeeled garlic, black peppercorns, cinnamon, nutmeg, bay leaves and ½ teaspoon salt. Bring to a boil, reduce heat to a simmer and cover the pan. Cook 30 minutes and turn the meat. Cook 30 minutes more and turn the meat. Cook until meat is very tender when probed with a skewer, 30 to 40 minutes more. Braised pork shoulder is tender and juicy. Remove meat to a cutting board. Sieve the remaining liquid, discarding bay leaves, cinnamon and garlic. (If desired, return the peppercorns to the cooking liquid.) Place it in a small saucepan and cook, uncovered, until sauce is reduced and thickened, about 20 minutes. 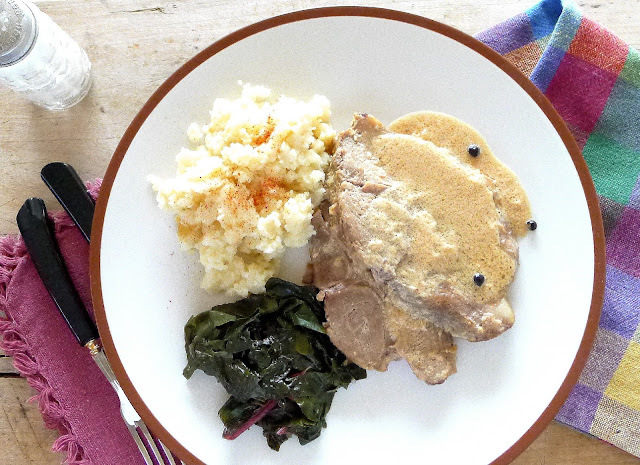 Another recipe for braised pork is here. Maybe where you live the Christmas holidays are finished. But, here in Spain, they continue through January 6, the festival of Epiphany, known as Los Tres Reyes Magos—“Three Kings’ Day.” The Three Kings—not Santa Claus—deliver presents to good girls and boys. And more holiday means more feasting, more sweets. 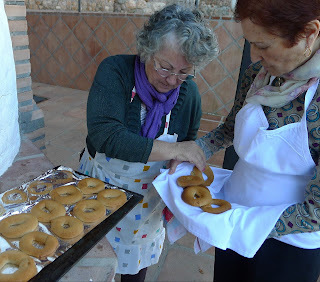 So, in the week between Christmas and New Year, I joined my friend Antonia Tamayo to make two more kinds of roscos, typical ring cookies. A plate of sugared roscos de aguardiente. Antonia lives in the village, but frequently visits family on the farmstead in the country where she grew up. During the holiday season, she fires up the horno de leña, the old wood-burning bread oven, to make roscos de aguardiente, doughnuts flavored with anisette liqueur, enough to last the extended family through to the twelfth night of Christmas. 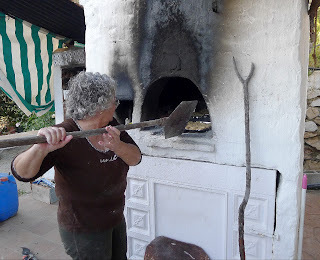 Antonia starts the fire in the outdoor oven. 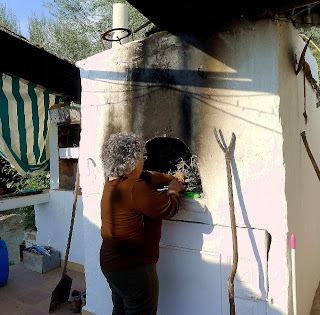 This time of year, she uses small olive branches as fuel. The inside of the oven is vaulted to provide good heat circulation. It is built of brick and finished with a mortar of clay and whitewash. It has a small arched door and, at the back, a small hole to provide an inlet for fresh air. 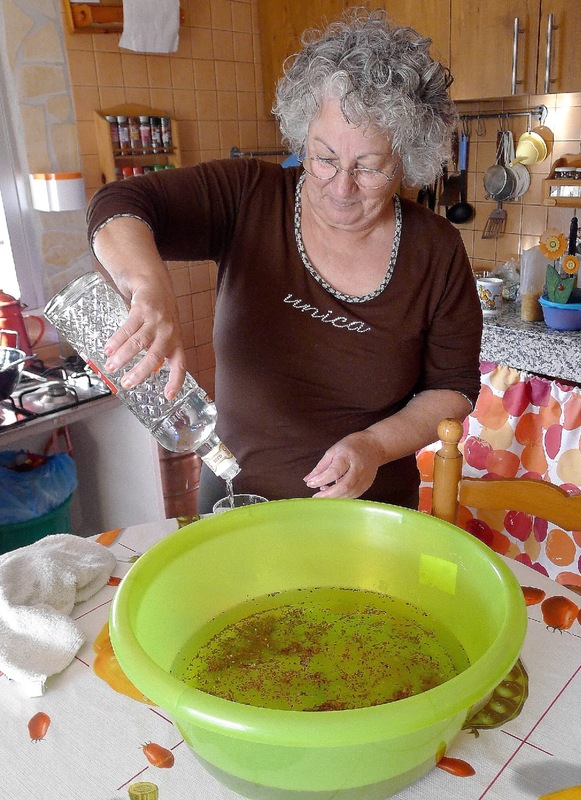 Antonia measures 4 glassfuls of aguardiente--anise liqueur. (Notice the wonderful serrated bottle.) 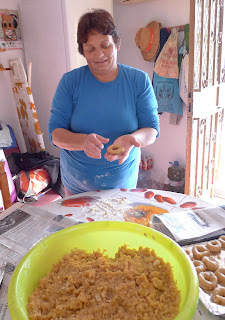 She adds it to the big bowl which contains 8 cups of oil (she uses sunflower oil, but it can also be olive oil) that has been heated with a handful of aniseed; 3 handfuls of sugar and about a cup of ground peanuts or almonds. How much flour? I start out counting the scoops Pepi adds, dipping from a 25-kilo sack. But after about 15, I lose track. Antonia says the dough needs enough flour to make a stiff dough that can be rolled. But not too much, or the baked cookies will be hard and dry. We all three lend a hand in rolling out the roscos. Not as easy as it looks, as the dough tends to crack when shaped into a ring. A small ball of dough is rolled into a rope about 1/2-inch thick and 5 1/2 inches long, then pinched together to form a ring. The roscos are placed on foil-lined oven trays. Antonia checks the oven and proclaims it ready. 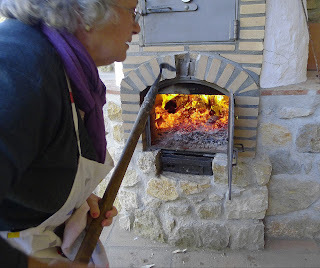 Antonia first sweeps the coals and ash to one side and uses a baker's peel to slide the trays onto the floor of the oven. Pepi sets up a table on the patio in front of the oven. 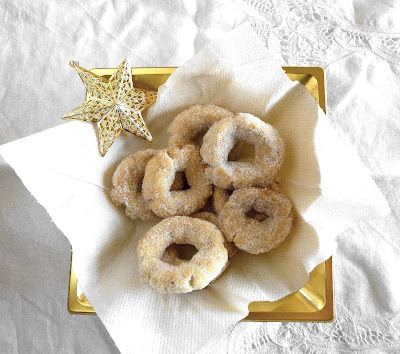 As the baked roscos come out of the oven, they are dredged while still hot in granulated sugar and placed on another tray to cool. A few of them break, so we sample them. So good! Crunchy and crumbly at the same time. The anise flavor is subtle. Another day, another oven, more roscos. 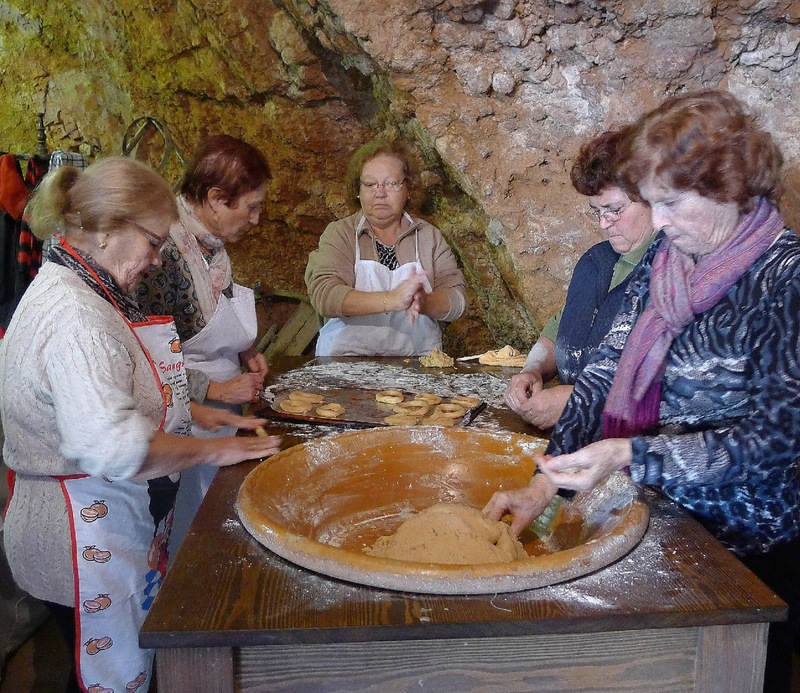 Antonia and a group of friends get together to make hundreds of the cookies to divide between them. 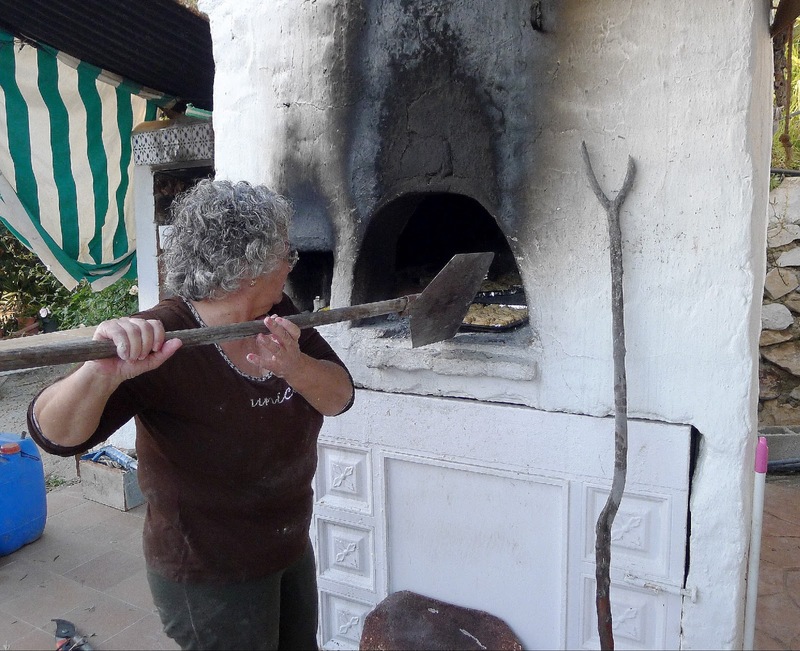 This oven is located right in the village. 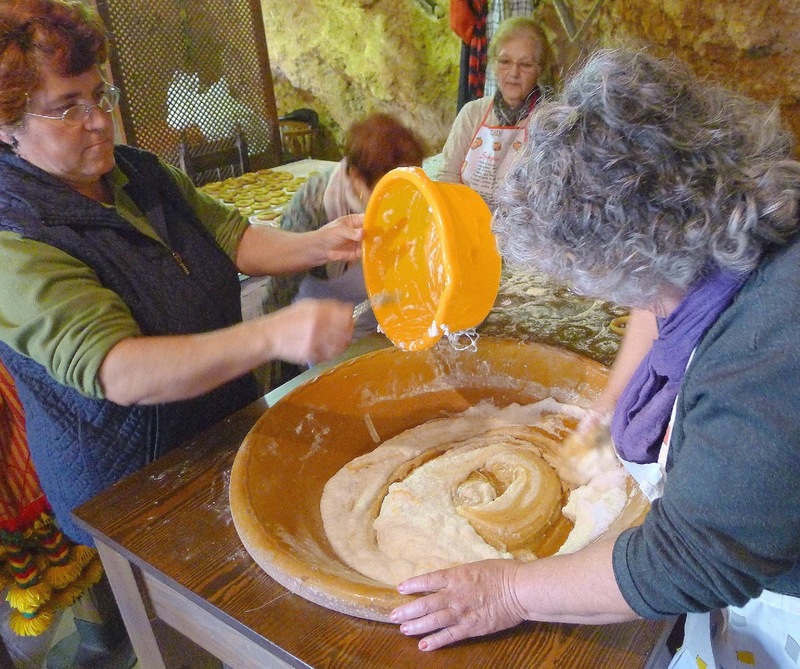 Along with a small working molino--mill to grind flour--it was built only a few years by the town hall to preserve some of the traditional folkways. While the women are kneading the dough, shaping the rings and placing them on trays, Japanese tourists come to have a look. Spanish tourists too--they want to buy a sackful of roscos. But these are not for sale. A domed oven in the traditional style, this one has a separate firebox, so it can be fueled while bread is baking. 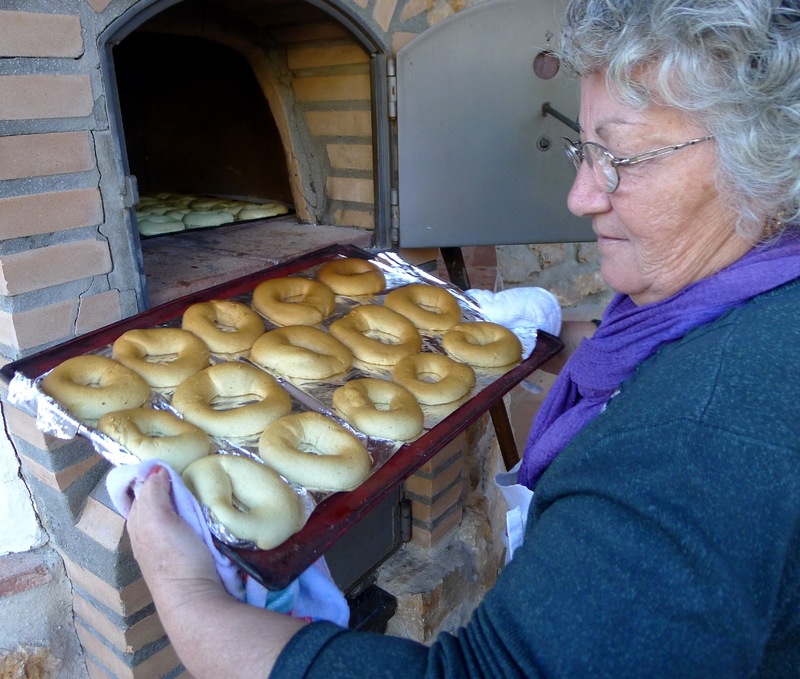 Antonia said it takes much longer to heat than the one she uses in the country. One woman separates a dozen eggs; the other grates lemon zest. 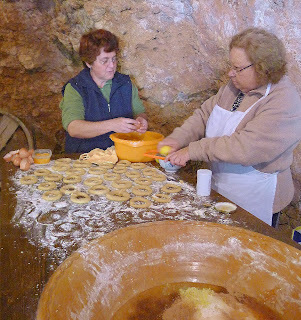 They are preparing to make roscos de huevo--egg doughnuts. The yolks go into the big bowl with a kilo of sugar, a glassful of honey, 3 glasses of oil, the zest of two lemons, 3 heaping teaspoons of cinnamon and 12 heaping teaspoons of baking soda. The egg whites are whipped until stiff, then folded into the yolk-oil mixture. 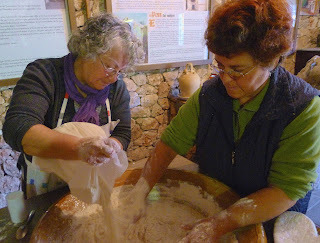 Then flour is added, about 3 kilos, and kneaded to make a smooth dough that can be rolled into ropes and shaped into rings. 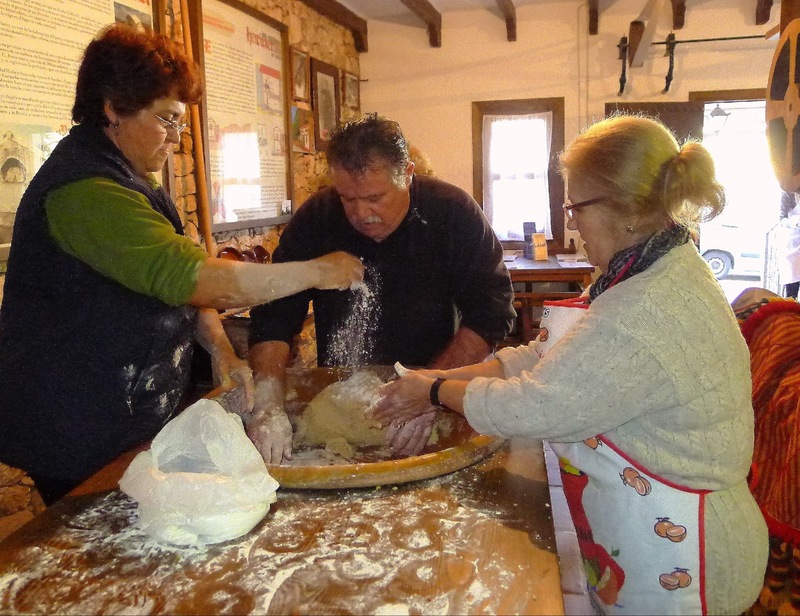 When the heavy dough gets too stiff to knead, the women call in Antonio Garcia, the manager of the municipal mill and oven. 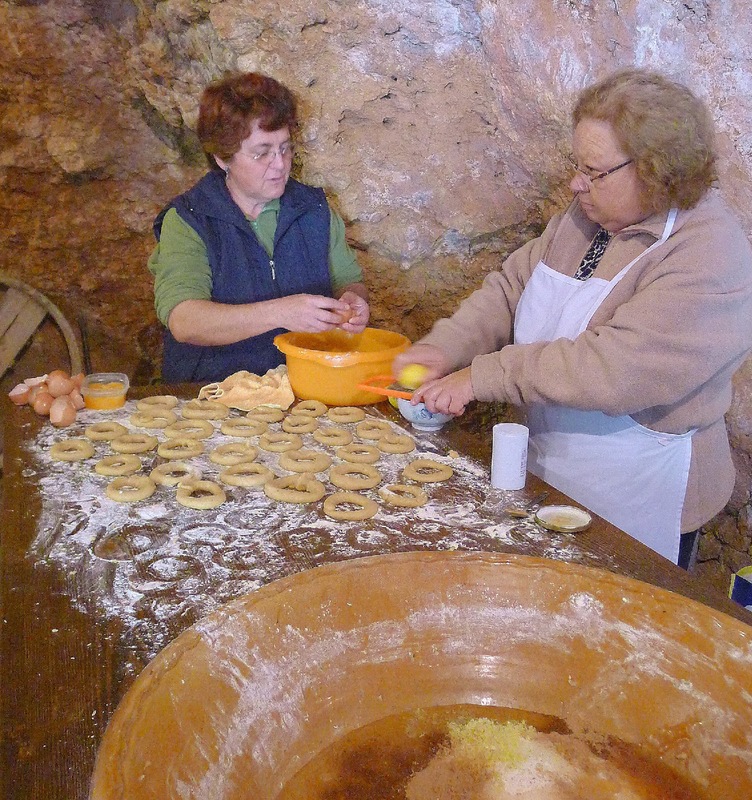 Then all hands get busy rolling the roscos and placing them on foil-lined and oiled baking sheets. They turn out three batches of about 90 roscos each to be divvied up between six of them. 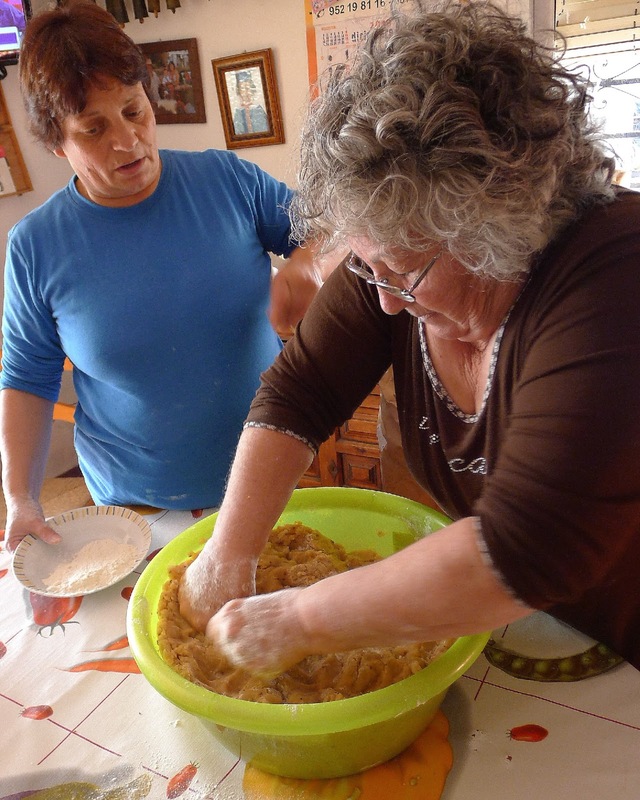 Some of the women remember making holiday sweets with their mothers and grandmothers. Others are new to it. 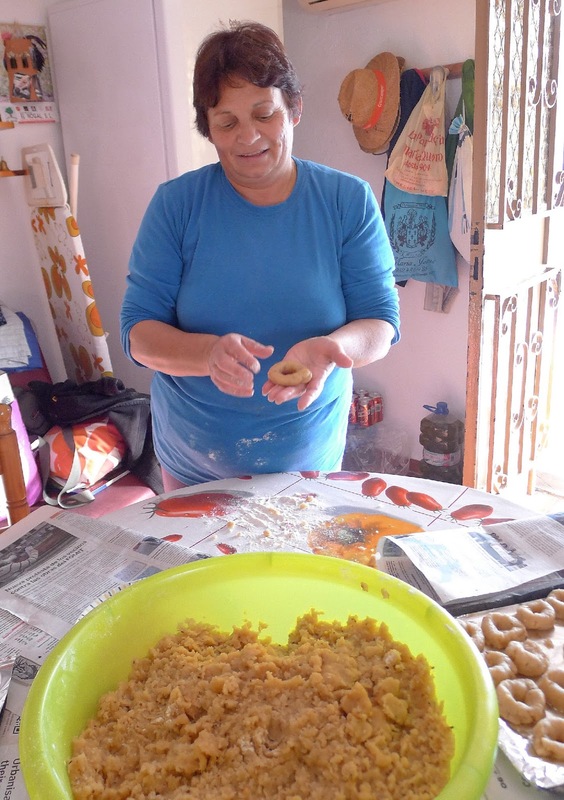 They chatter about other favorite Christmas sweets, such as fried empanadillas filled with sweetened sweet potatoes. The mill and kitchen are situated in a natural grotto--thus the stone and earth wall behind the ladies. 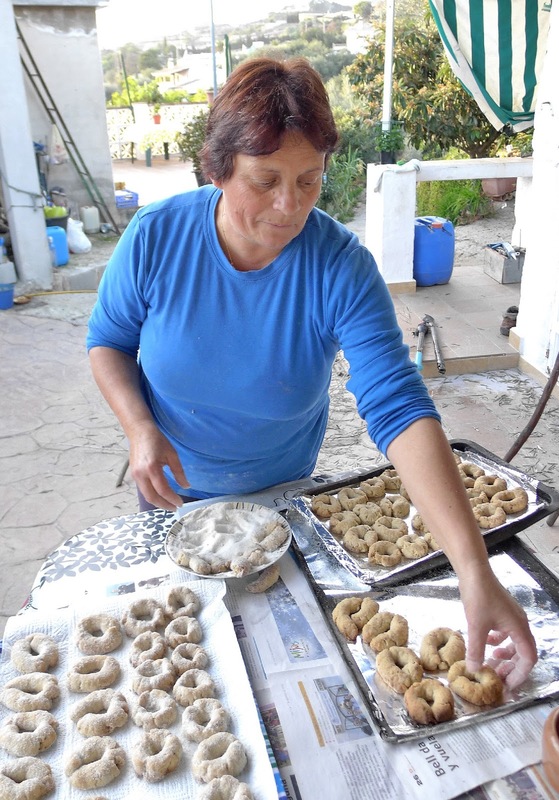 Antonia slides a tray of roscos out to move it to the other side so the cookies bake evenly. They are done when they lift easily off the tray. Some are returned to the oven to finish baking. 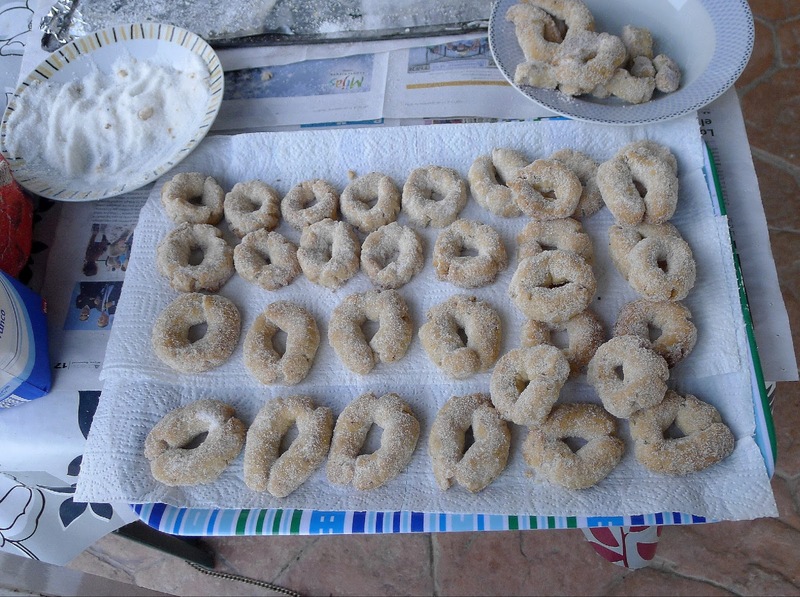 Roscos de aguardiente, fresh from the oven, dredged in sugar.